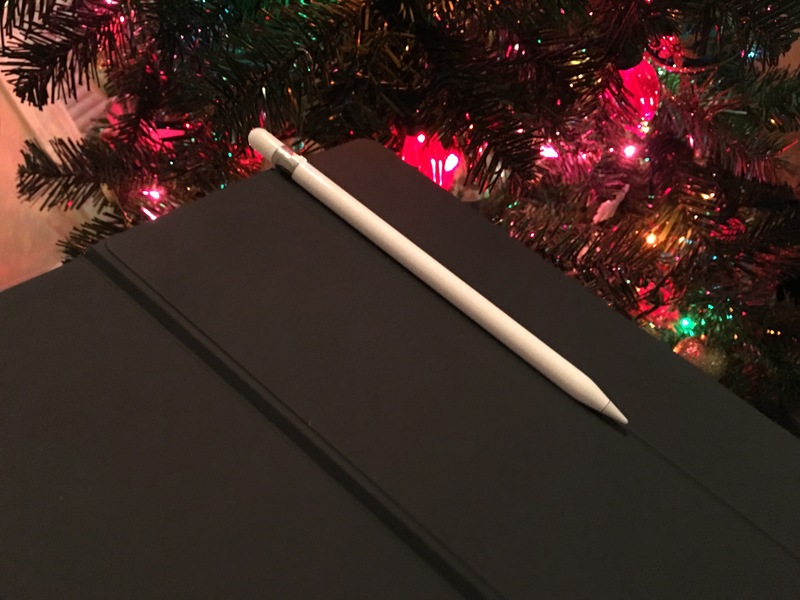 Apple Pencil is a terrific digital stylus that transforms iPad Pro into a highly capable electronic sketch pad and notebook, but it’s dead simple design potentially leaves something to be desired for some users. For example, its cylindrical-shaped symmetrical body lacks a basic pen clip for attaching it to your shirt pocket or elsewhere, which makes it look prettier and simpler but means it easily rolls down inclines and can’t attach to cases or pockets. Apple has weighted it internally to sit in place on a flat surface cleverly with the Apple Pencil marking facing upward, but it’s still no match for a slight slant and where exactly are you supposed to put it? This creates an obvious opportunity for accessory makers. There will surely be a market of add-ones for Apple Pencil, it’s just a matter of time of course, and case makers like Urban Armor Gear are already tackling the problem with solutions like this. But I’m plenty happy with either a Smart Cover or Smart Keyboard, personally, and don’t much want a spot on my case dedicated for stashing the Apple Pencil. What have I found to work best for me? The novel idea of one clever Reddit user called texasdoesitbest posted late last month. 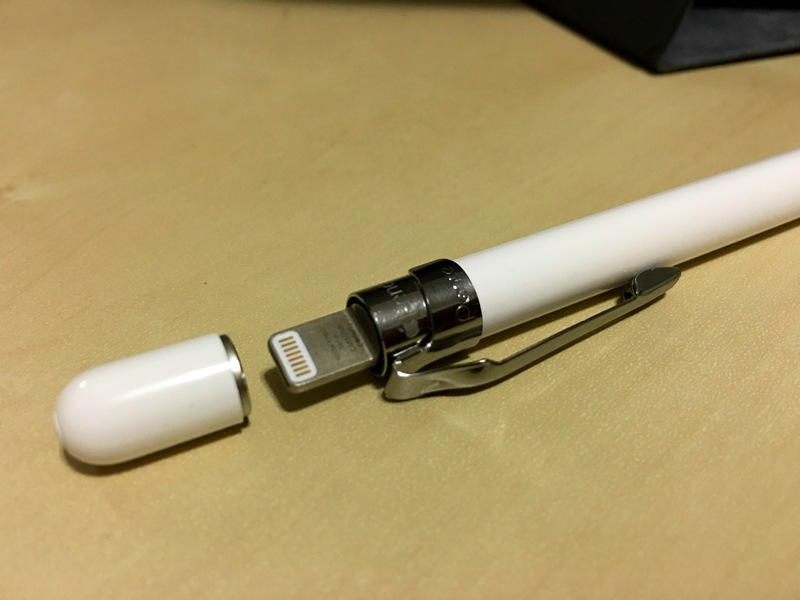 Buy a particular basic mechanical pencil with a removable metal clip, detach it, and slide it on Apple Pencil. It’s a nearly perfect fit and only costs a few bucks. 1. Apple Pencil, you wouldn’t have this problem to solve otherwise right? 2. Pentel Sharp Automatic Pencil, 0.5mm — I picked up a 2-pack for under $10. 3. Something to attach it to — it clips along pretty nicely to the fold of the Smart Keyboard and feels more secure than a magnet solution might. Most of the work is in removing the attached clip from the mechanical pencil. I found that it’s secured on fairly well, but it does separate on one side without bending too harshly and slides off. It’s hacky, but I used a butter knife to pry it off. Once the metal clip is freed, it’s time to attach it to Apple Pencil. You could bend it outward enough to fit over the removable Lighting connector cover, but I found it easier to slip it from the nub end which is pointed and smaller than the clip’s opening. Once you get past the nub, Apple Pencil thickens and enough so that it easily lets the clip securely hug it and stay put. Just slide it upward to where you like it. After trying a few spots, I found that placing the clip part just to the left of the Apple Pencil marking on the metal band fits really well — it doesn’t obscure the tasteful Apple branding and it actually aligns almost intentionally with the Lightning connector under the cap. It’s not an absolutely perfect solution: the band doesn’t fully enclose so there’s a white gap opposite the clip, you could potentially scratch Apple Pencil’s plastic casing or metal ring if you slide it on too tightly, and there’s both Pentel and Japan stamped into the clip band. 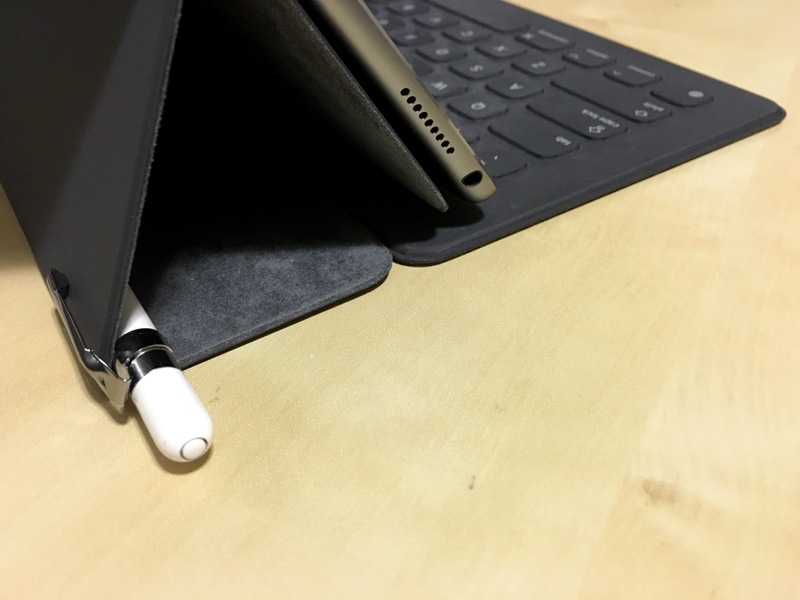 I have found it to be highly practical, however, and clipping it to the Smart Keyboard’s cover means I’m much more likely to have Apple Pencil around during leisure time for spontaneous doodling and not just in my backpack or at my desk. I’m not completely in love with how it looks attached, but there is something typical about the pen and clipboard effect it creates. I’m curious, now, to see the inevitable market of pen clips created especially for Apple Pencil to develop. Pentel Sharp Automatic Pencil 0.5mm is sold from $6.00 on Amazon. 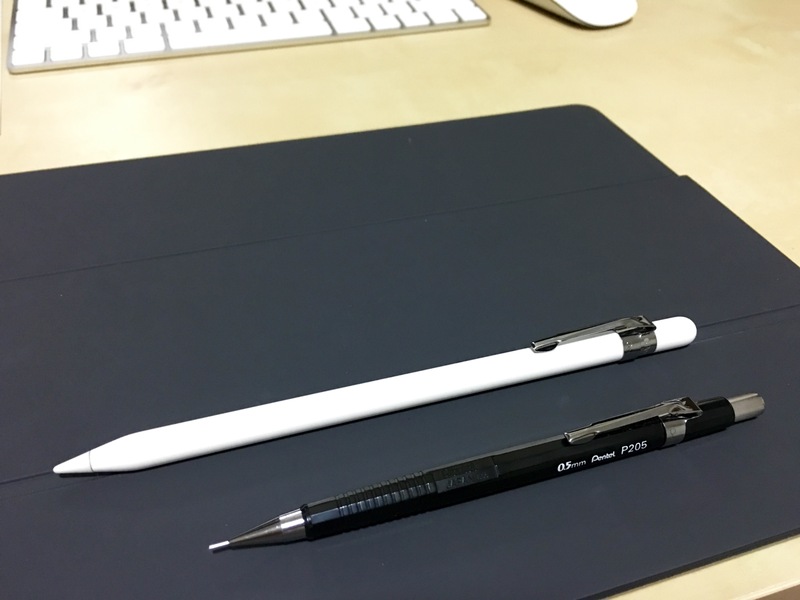 Don’t have an Apple Pencil or prefer a less enormous iPad? Adonit Jot Dash is a recommended iPad stylus that features its own clip.